A dog’s unique build and sleeping habits mean that each pup needs a high-quality bed. With a wide variety of products specially designed for dogs of varying sizes and health needs, there’s a bed that keeps every dog comfortable and secure. The ReviewLab team delved into the world of dog beds to come up with the best options in five categories, from beds for large dogs to the best beds for chewers. In each review, learn more about the padding used in the bed, its ergonomic features, how easy it is to clean, and other important features. Read more about our methodology. 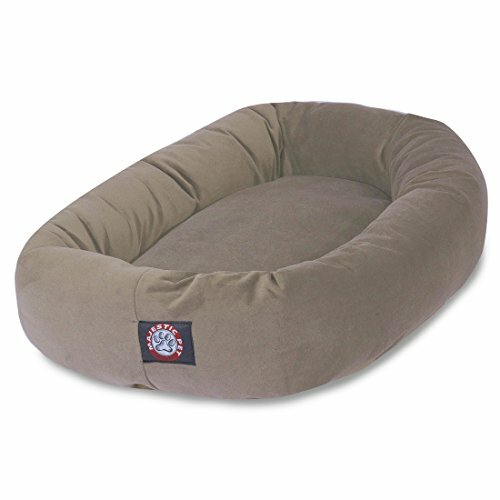 In addition to polyester fill that supports your dog’s joints and an appealing donut shape that makes pups feel safe, the Majestic Pet Suede Bagel Dog Bed offers waterproof protection and a non-slip base. 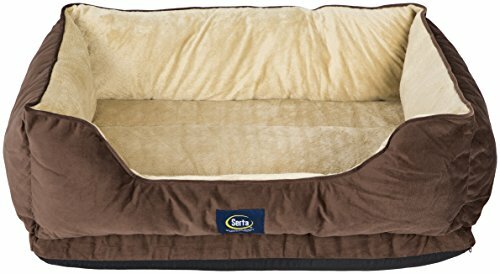 With a firm memory foam layer and high sides that let dogs focus on sleep, the Serta Cuddler Dog Bed is a great value for dogs who need orthopedic support and a bed with ergonomic features. 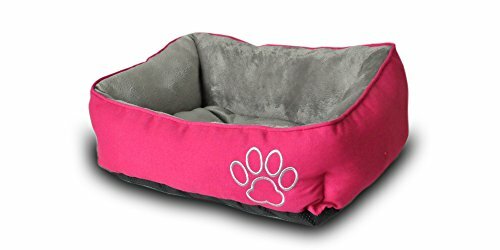 Available in a range of bold colors and three sizes to fit a wide range of dogs, the PetPaw Print Pet Bed is a competitively-priced choice. It’s also machine washable and features a removable pillow. For a dog who loves to snuggle, the Aspen Pet Self-Warming Bed offers space-tested technology that makes the most of a dog's natural warmth. A non-skid bottom ensures that active dreamers won't kick the bed out of place in their sleep. If you’re looking for a dog bed that can stand up to constant chewing, we recommend the Kuranda Dog Bed. Its sturdy PVC frame and thick fabric make it a strong alternative to standard dog beds. Designed with arthritic dogs in mind, the PetFusion Serenity Lounge combines a memory foam mattress with a removable cover for durability and joint protection. It features a water-resistant cover that protects the memory foam from damage. If you need a dog bed with flat sides and lots of leg room, the Milliard Orthopedic Dog Bed is what we recommend. Protect against joint pain caused by arthritis and age with the bed's memory foam layer. 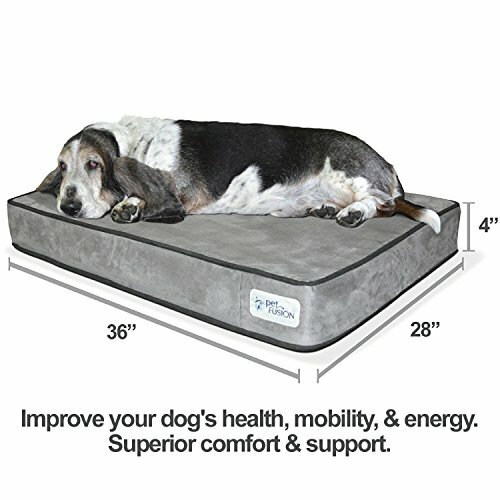 If your large dog needs a place to rest his head and stretch out, consider the BarksBar Large Orthopedic Dog Bed. With popular features like a thick layer of memory foam and plenty of padding, it’s sure to help any large dog wind down. If you're looking for a bed that offers as much joint support as possible, the Big Barker is large enough to suit large and extra-large dogs. The dense memory foam soothes joint pain for a relaxing night of sleep. Many dogs suffer from or are prone to joint pain, which is why ergonomic support is crucial for your dog’s comfort and joint health. Quite a few products use egg crate or memory foam, which protects the joints and keeps your dog’s weight evenly dispersed. If you find a bed with foam, find out if it uses shredded foam or a large single piece of foam. Shredded foam is similar to polyester fill, since it can pile up inside the bed and flatten over time. In comparison, a single layer of foam maintains the same level of protection throughout the bed. Consider the weight limit of a bed as well, since a dog at the high end of a bed’s weight limit is likely to flatten the bed’s filling, minimizing joint support. Not all dogs need a bed with a waterproof layer, but dogs who are prone to accidents really do need a barrier between them and a bed’s filling. Water protection is especially important in orthopedic beds, since memory foam can be difficult to clean. Waterproof liners prevent permanent odors and staining. Among beds with waterproof design features, some have a layer that sits directly beneath the dog and prevents leaks from soaking into the bed. Others have a waterproof case that wraps around the filling or foam of the bed. Consistent cleaning is key to avoiding a buildup of dog hair and odors on a pet bed. While comparing options, consider how easy each one is to clean. Some beds are completely machine washable, so you can just put the entire bed into the washing machine and let it go. Other models have a single zipped compartment that holds the pillow or padding. The liner is typically removable and washable, but the padding isn’t necessarily machine washable. While most wrapped padding can be washed in the machine, it may pile up and accumulate in random parts of the bed, causing discomfort. Memory foam can usually be hand washed but isn’t usually machine washable. For $30 or less, you can get a dog bed with cotton filling or shredded memory foam. These beds tend to flatten with age, providing less joint support to dogs over time. At this price point, there are some models with orthopedic egg crate foam. Dog beds priced between $30 and $75 often have more ergonomic features, including memory foam and extra padding. High-end dog beds, including many orthopedic and chew-resistant models, often cost between $75 and $150. Some options cost up to $200 or more. The Majestic Pet Suede Dog Bed offers joint protection, spine alignment and comfort for medium to large dogs. The center area of the bed is stuffed with polyester fill that cushions the joints and allows dogs to burrow in. Prevent bathroom accidents from reaching the floor with the bed’s waterproof base. While the bed is designed for dogs between 41 and 70 pounds, owners of smaller dogs claim their pets love the freedom they have to spread out in this bed. The versatility and durability of this bed make it an obvious choice for our top pick. Raised edge supports spine alignment. The bagel design of this bed gives large dogs the perfect place to rest their heads when relaxing, which keeps the spine straight. Dogs can also curl up in the middle of the bed without using the edge as a pillow—reviewers note that their dogs enjoy the den-like experience. Easy washing with dual pillow design. The 40-inch model comes with two separate pillows: the center pillow and the long pillow, the latter of which wraps around the outside. Consumers note that this makes washing much easier and keeps the bed smelling fresh. Optimal comfort with microsuede cover. 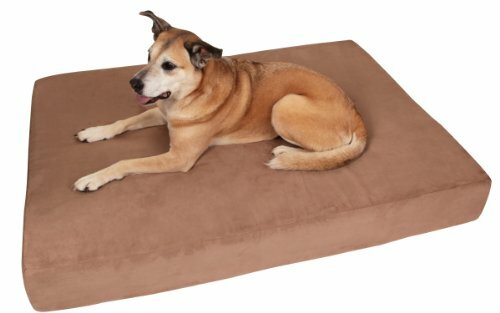 Combined with the polyester filling, the microsuede cover offers a plush yet supportive place for a large dog to lie down. Some customers report that this is the dog bed that finally gave them their beds back, since it’s comfortable enough for dogs to sleep on all night long. Waterproof base protects against accidents. Whether you’re worried about spills or accidents, the waterproof base keeps smells and liquids out of the bed. Several reviews verify that this bed stands up to their dogs’ bathroom accidents, keeping the mess contained. Chewers have no problem breaking nylon zipper. The nylon zippers aren’t as durable as metal zippers, and reviewers claim that heavy chewers can break the zipper in very little time. This isn’t an issue for dogs who aren’t prone to chewing, and some users have successfully broken the habit by keeping a chew toy in the dog bed. Fur can get caught in top zipper. The two-zipper design does make cleaning easier, but it also places a zipper on the inside of the bolster. If dogs use the bolster as a headrest, the zipper could tempt them to chew or get caught in their fur. Dogs instinctively want to feel safe when they let their guard down to sleep. The raised sides of the Serta Cuddler help dogs block out the outside world, making it even easier for them to drift off into dreamland. Orthopedic memory foam cradles the joints, which is why this is a popular pick for aging or very active dogs. 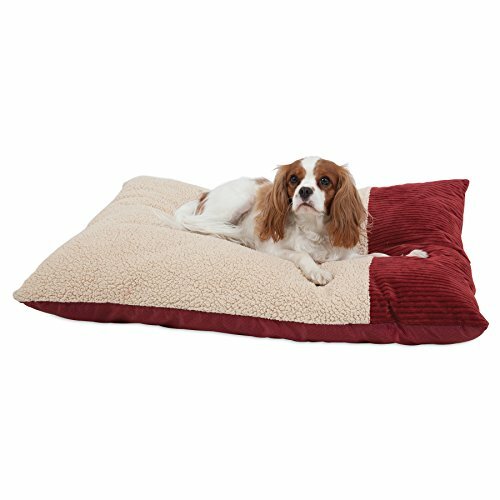 Designed for small and medium dogs, this product combines a competitive price with popular features to create a bed that makes dogs and owners happy. Orthopedic foam offers joint support. The Serta Cuddler has a two-inch layer of memory foam that cradles the joints to minimize stress and pressure. Several reviewers note that dogs recovering from surgery show less pain and discomfort when using this bed. This feature is also ideal for senior dogs who suffer from arthritis or other types of joint pain. Dogs feel safe with the walled design. The front of the bed has a slightly raised edge for easy entry. The remaining three sides are 10 inches high, giving dogs an enclosed feeling that encourages healthy rest. According to multiple reviews, the walls stand up to constant use without flattening or caving in. Easy to pack for on-the-go use. With its plush design, the Serta Cuddler is easy to roll up and take on the road. This bed also fits most kennels, so long car trips can be a little bit easier for everyone. Too firm for some dogs. The memory foam in this bed makes it considerably firmer and denser than many other models. While this is a huge benefit for some dogs, others prefer a softer design and dislike the firmness of this bed. Loose fill bedding makes cleaning difficult. This bed uses loose fill. To clean it, you must remove the stuffing and put it back in after the cover has been washed. This takes a bit longer than cleaning beds with wrapped filling. Despite this, several reviewers say that it only takes a few minutes to put this bed back together. The appealing design of the PetPaw bed makes it a natural choice for all types of dogs. It features a slightly raised entry with sides that slope up to create a bolster design. The plush pillow insert helps dogs settle down and prepare for rest, but those who prefer a hard surface also enjoy the flexibility of the removable pillow design. Available in three sizes, this bed is a budget-friendly option for most pet owners. Removable pillow offers customization options. This bed is much fluffier than other models on the market, so it’s ideal for dogs who like to sink into bed and be cushioned on all sides. The center pillow is removable, so dogs who prefer a firmer surface can remove the pillow and just sleep on the bottom. Raised sides help dogs feel safe. The cuddler design of the PetPaw bed minimizes distractions. 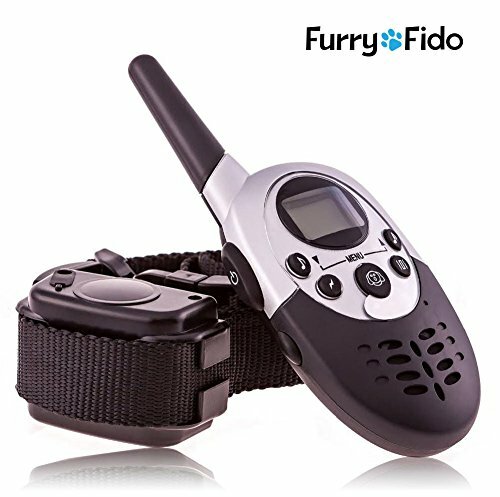 This feature is excellent for excitable dogs who have difficulty falling asleep when there’s noise or action nearby. On top of that, the bolster design makes pups feel secure and protected. Entire bed is machine washable. Frequent cleaning keeps beds looking and smelling fresh. There are no zippered compartments on the PetPaw bed, so users can simply toss the entire bed into the washing machine to make it look new again. The inner pillow can be washed on its own as well. Can fall apart in the washing machine. While the company does advertise the bed as machine washable, a handful of reviewers report the bed coming unraveled or falling apart during a wash cycle. Using gentle wash and dry cycles can extend the longevity of the bed. Many dogs like to cuddle up with a human or another dog to sleep. When that isn’t an option, this self-warming bed is the solution. The heat-reflecting blanket doesn’t use any electricity or power source, so it’s safe and easy to use anywhere. Your dog can sink in and relax with the faux wool cover, which also absorbs and preserves heat. This bed offers top-notch warmth and comfort at a low price. Heat-reflecting technology keeps pets warm. Each bed has a layer of heat-reflecting material that absorbs your dog’s body heat and uses it to generate more warmth. Reviewers claim that this feature has helped finicky sleepers finally enjoy a full night of rest. It’s particularly convenient for dogs who prefer to sleep near humans for their body warmth. Pillow design lets pups stretch out. For dogs who don’t like to feel confined, a pillow bed is the natural choice. The sides lie flat, letting your dog sleep curled up, sprawled out, or in any position they find comfortable. Non-skid design keeps bed in place. If your pup is a fitful sleeper, you’ve likely woken up to find the dog bed across the room from its original location. The Aspen bed has a non-skid bottom, so dogs stay safe and warm all night long. Crinkly sound scares some dogs. The layer that reflects heat uses a material that crinkles under pressure. If your dog is skittish, this sound could spook them as they lie down. Some dogs love to chew, and many standard dog beds fall apart after a few good chew sessions. If you’re looking for a dog bed for your chew-happy pup, getting an extra-durable bed could save you from having to invest in replacement beds multiple times per year. Good dog beds for chewers typically use stronger materials and have as little stuffing as possible, making chewing less rewarding and minimizing the fallout from this behavior. For anyone who’s tired of replacing torn-apart dog beds, the Kuranda dog bed is the solution. It uses furniture-grade materials for added strength and resistance, even when used by the most persistent chewer. The bed’s Cordura fabric supports a dog’s joints and relieves pain caused by arthritis. Not only is the bed difficult to chew, the hidden fabric edges make it harder for dogs to find a starting point. Sitting six inches off of the ground, the bed maintains airflow for your dog’s comfort. Strong PVC frame supports large dogs. Designed to hold dogs up to 125 pounds, this bed is a convenient choice for many large breeds. The PVC frame is extremely durable, maintaining its shape with frequent use and pressure. Reviews report that these beds hold up well in dog shelters, where they are used constantly by multiple dogs, washed frequently, and moved around. Keeps dogs dry and cool with its elevated design. Elevation makes this bed a viable choice for indoor and outdoor use. The elevated surface promotes optimal airflow, minimizing sweating and keeping your dog cool. Additionally, this type of bed keeps your dog dry when sleeping on wet ground. Hidden fabric edges discourage chewing. The PVC frame hides the edges of the Cordura fabric used in this bed. This feature makes it harder for dogs to find a spot to chew, reducing temptation. Enhanced orthopedic support. The firmness of this bed allows it to support dogs with joint issues. Although the bed is elevated, the step of six inches is short enough for large dogs to tackle without pain or discomfort. Sound can be upsetting to nervous dogs. The bed’s Cordura fabric is pulled tight around the PVC frame, which causes a hollow, drum-like sound when dogs climb on. According to reviewers, this does not disturb most pups, but can discourage a skittish dog. Center is prone to sagging. A few reviews note that the center of the bed sagged after weeks of daily use. Avoid this issue by using the dog’s weight, rather than height, to determine which size to get. An orthopedic bed is a necessity for dogs who have been diagnosed with arthritis or have difficulty sleeping due to joint pain. Some dog breeds are prone to joint issues, and using an orthopedic bed can be a preventative measure against later problems. This type of bed uses specialized filling to support joints and reduce the stress they experience during sleep, allowing dogs to remain more active and pain-free while awake. Most models sit close to the ground, accommodating dogs who have difficulty jumping or climbing into bed. Dogs with joint pain often wake up from a night of sleep with stiff joints and pain, making it hard for them to enjoy their day. The PetFusion Serenity Lounge aims to combat most of the issues faced by arthritic and senior dogs. The memory foam mattress offers the perfect amount of support and comfort to dogs, ensuring that their joints get a break after each busy day. The bed is only four inches tall, making it easy for dogs to climb in and out of without any pain. Four-inch memory foam supports dogs of all sizes. Every dog sleeps differently, and a memory foam dog bed works with all types of sleeping positions. The memory foam adjusts to the shape of your dog’s body, dispersing weight evenly across the bed. Few beds offer such a thick memory foam layer, making this an ideal option for dogs up to 100 pounds. Enhanced durability with metal zipper. While some other beds come equipped with a plastic zipper, this model has a sturdy metal zipper that is resistant to chewing and breaking. This is an important feature for large dog breeds that are prone to chewing. Easy cleaning with removable cover. This bed uses a slip-on microsuede cover that zips closed. It cleans quickly and thoroughly in the washing machine without losing softness or thickness. Water-resistant cover minimizes mess. Bathroom accidents can permanently damage a dog bed, but the water-resistant cover keeps accidents from reaching the memory foam mattress. Several reviewers note that the cover successfully keeps the memory foam dry, even after a large dog’s accident. Not durable enough for chewers. The bed cover is tear-resistant, and many reviewers claim that it successfully withstands the scratching of their dogs. However, a few report that the cover is not strong enough to handle a large dog’s chewing and that their dogs left the memory foam shredded in a matter of hours. If you have a chewer on your hands, consider a dog bed specifically designed to minimize this behavior. Milliard creates a quilted pillow top bed that fits dogs of all sizes. This flat-top bed gives pups plenty of room to stretch out, while the firm foam layer cushions the joints to minimize joint pain and stiffness. Designed to fit in standard kennels and crates, this orthopedic bed also blends in well with many types of decor. The removable quilted cover makes it easy to keep the bed clean and free of odors. Ergonomic design offers joint protection. Orthopedic support is the key feature for aging dogs and those suffering from arthritis. This bed features a thick layer of egg crate foam that is designed to disperse a dog’s weight evenly over the surface of the bed, rather than putting extra stress on the joints. This leads to a better night of sleep and less pain for your pup. Extra comfort with the pillow top layer. If your dog enjoys the plush comfort of a standard dog bed, the pillow top layer delivers, without minimizing the support of the memory foam layer. 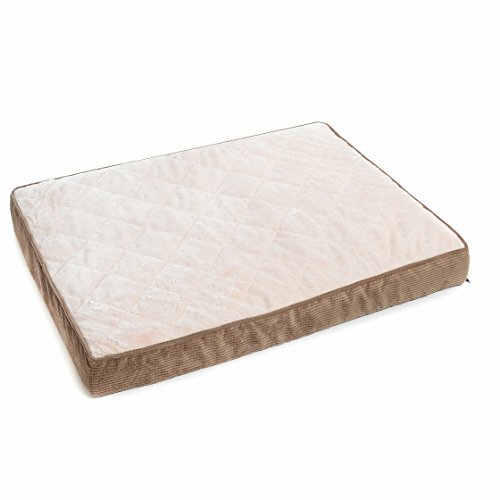 The quilted pillow layer zips around the foam bed for easy removal and washing. Conveniently sized for kennels. This bed comes in two different sizes. The smaller option fits a standard 36-inch dog crate and the larger model fits a standard 42-inch dog crate. A comfortable bed can make crate training much more enjoyable for dogs and owners. Foam maintains its shape over time. Stuffed beds can change shape over time, depending on how the stuffing settles after multiple uses. In comparison, foam keeps its form and its level of ergonomic support, even with extended periods of use. No waterproof liner. 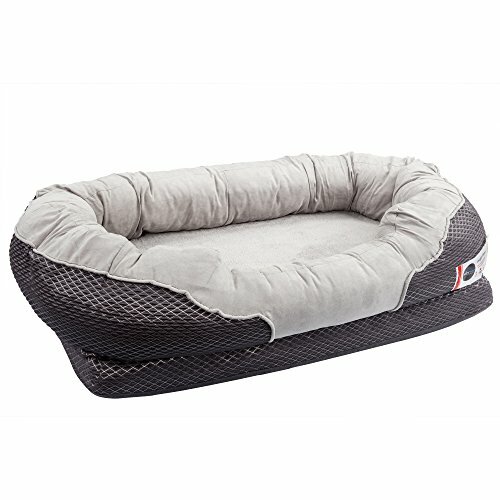 Waterproof protection is a common feature in dog beds, but this bed does not have a waterproof layer. However, the quilted layer and foam are both machine washable. Large dog breeds have special dog bed needs. Many of these breeds are prone to joint pain and stiffness, particularly as they age, so ergonomic design features are essential. These beds offer equal support on every part of a large dog’s body, allowing them to lay comfortably in a variety of positions. Some large dog beds have a bagel design with bolstered edges that serve as headrests, while others have a flat pillow top design that encourages dogs to stretch out. With high padded edges and a thick layer of cotton padding, the BarksBar bed for large dogs is our top pick for large dogs who enjoy the safety of a den-like bed. While dogs enjoy the comfort of the cotton padding, owners feel confident that the foam layer in the BarksBar protects their pup’s joints and muscles. In addition to its ergonomic foam layer, the BarksBar has a low entrance that makes it an appealing option for owners of senior dogs and dogs with joint pain. Two types of padding offer exceptional comfort. Many dog beds have memory foam or fluffy padding, but this option offers both. Orthopedic foam, which contours to a dog’s body and offers optimal joint support, makes up the bottom layer. The upper layer, which is in a separate zippered compartment, is wrapped cotton padding. Low front edge makes getting in and out easy. The BarksBar bed features a bagel design with three raised sides. The front side of the bed is a few inches lower than the rest of the sides, offering arthritic and senior dogs a simple and pain-free way to get in and out of bed. Neck support with bolstered edges. Big dogs benefit from proper neck and spine alignment with the high bed sides. The sides contour to a pup’s head or neck, acting as a pillow and relieving neck stiffness. Dogs who prefer to curl up to sleep can block out outside noises and distractions with this design. Difficult to wash away unpleasant odors. Unlike other large dog beds, this model does not have a waterproof liner or cover. 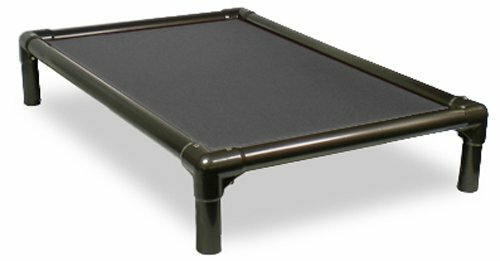 The bottom layer of foam can be damaged by moisture, so this bed may not be the best choice for dogs who are prone to accidents. Some reviewers recommend wrapping the foam layer in a trash bag or waterproof pad prior to use. If large dog beds are usually too small for your dog, the Big Barker is the answer. Designed for dogs as large as 100 pounds or more, the Big Barker offers seven inches of memory foam padding that prevents joint strain and eases existing joint pain. The tear-resistant cover is easy to clean and durable enough for large, active dogs. There are size options ranging from 48 x 30 inches to 60 x 48 inches, accommodating large breeds. Excellent joint support from seven inches of foam. Few dog beds can compete with the Big Barker in terms of padding. The bed sits at seven inches tall, offering plenty of cushioning for even the heaviest dogs. Reviewers report long-lasting comfort for dogs well over 100 pounds, also noting that the foam doesn’t flatten out over time. Extra-long zipper simplifies washing. The bed features a smooth microfiber cover that offers dogs an extra layer of comfort. It’s easy to wash, thanks to the extra-long zipper. Instead of trying to squeeze the foam out of a small zipper just to get to the cover, you can pop the foam in and out quickly. Hair wipes off for a like-new appearance every time. Dog fur is a fact of life when you own a pup, but the microfiber cover is very easy to keep clean. Hair wipes off with a wet rag, and several consumers note that the cover doesn’t trap pet hair like other beds do. Height can be difficult for some arthritic dogs. The thick foam is a plus for many dogs, but dogs who have trouble tackling steps can struggle to get onto the Big Barker. A few reviewers note that their arthritic dogs need to be lifted into bed each night. Using a small step can help arthritic dogs climb into bed without pain. No waterproof liner. The company does make a waterproof liner, but it is offered separately from the bed. Since the foam cannot be machine washed, odors from spills and accidents get trapped in the foam. This is primarily a concern for accident-prone dogs, since surface-level stains rinse out easily when you wash the cover.